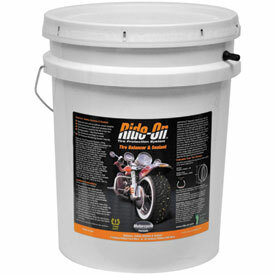 Ride-On is a tire sealant compound that evenly coats the inner surface of your tires. This coating lines your tires and makes them into self-sealing tires while you ride. Note: After installing the Ride-On ATV Tire Sealant into your tires you may notice a slight vibration until the sealant has warmed up and distributed evenly in your tires. This process usually takes 2-5 miles. Please DO NOT attempt to rebalance tire's after the installation of Ride-On Sealant.